With its old buildings, passing trains, vintage shops, and faded storefronts, Gladewater can seem like a relic from a bygone era. Elvis Presley used to play here. So did Johnny Cash. 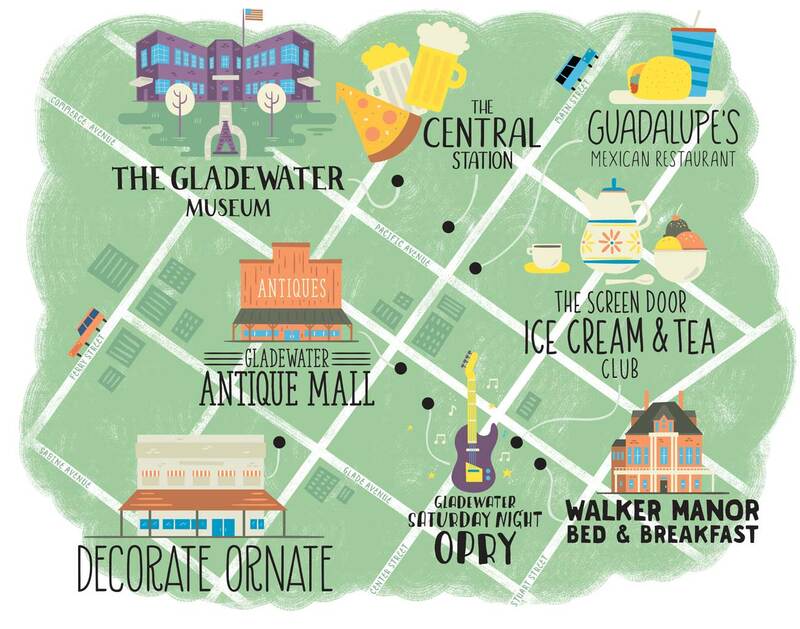 But in another sense, Gladewater is modern: The recent arrival of a brewpub and the opening six years ago of a bed-and-breakfast have turned the official “Antique Capital of East Texas” into one of the most walkable downtowns around. 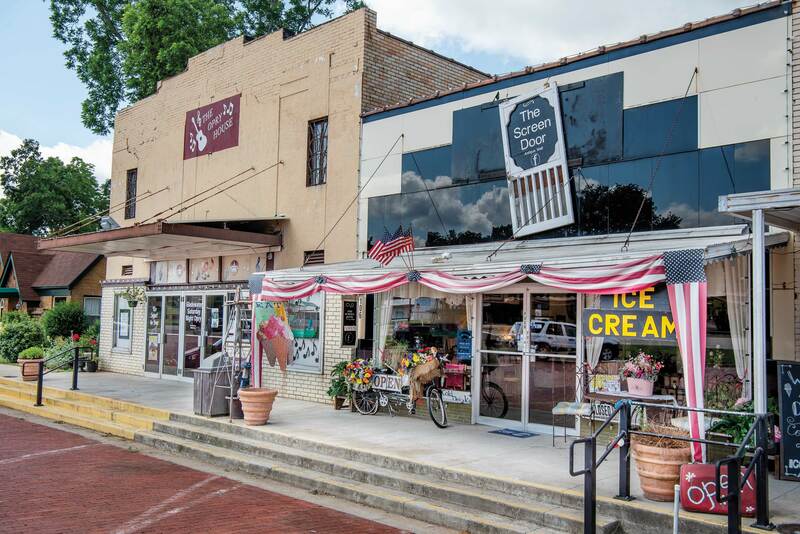 For visitor information, contact the Gladewater Main Street Program at 215 N. Main St. Mon-Fri 9 a.m.-5 p.m.
Once you get here—the town is about half an hour’s drive northeast of Tyler—vehicles become optional, and visitors can spend a weekend venturing no farther than a few blocks to shops, a couple of restaurants, and entertainment at the Gladewater Opry, a country music variety show that carries on old-time traditions of singers belting out rootsy tunes for live audiences. Trains rumble around the clock. A railroad line runs through the heart of Gladewater, and the wide, grassy lawns on either side of the tracks have the combined effect of a particularly long plaza or green space at the town center. On the edge of this main-street area, a stately mansion from the turn of the 20th century sits two doors down from the opry house. When I was growing up in a neighboring town, I was convinced the house was haunted. But Memori and Matt Ruesing purchased the three-story neoclassical home in 2009 and breathed life into it. 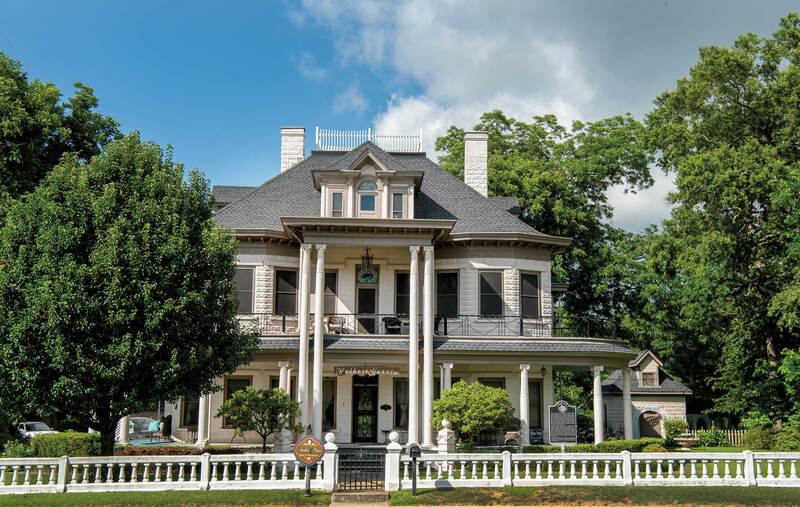 The couple named the property Walker Manor Bed & Breakfast for the original owners, physician and pharmacist Edgar Walker and his wife, Nancy Walker. 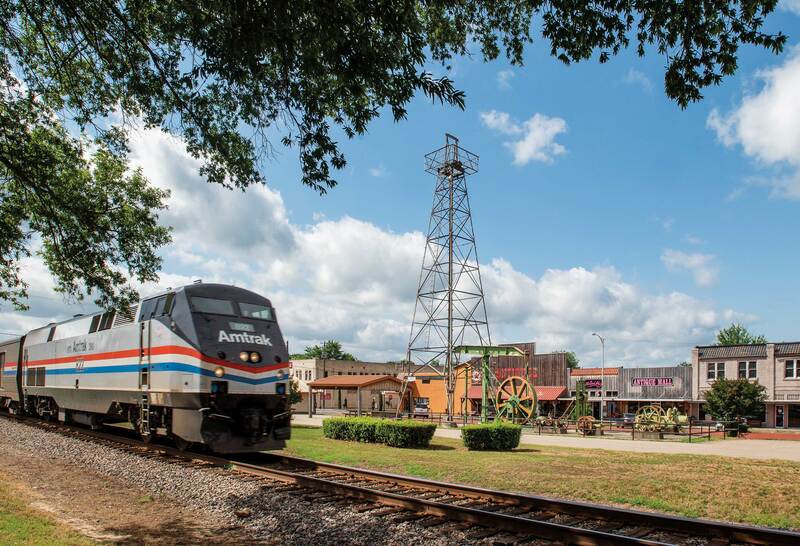 Trains roll ’round the clock through Gladewater, founded as an East Texas railroad stop in 1873. There’s no telling. Gladewater was founded as a railroad stop in 1873. After wildcatters struck oil nearby in 1931, the town’s population swelled from 500 residents to about 8,000. Housing was so hard to come by, the Walkers’ heirs leased mansion rooms to families of oil workers and rented cots on the second floor for 25 cents a day. “You had all these people moving into what basically became a boarding house,” said Memori, who estimates as many as 40 to 50 people could have been living there on any given night at the height of the boom. 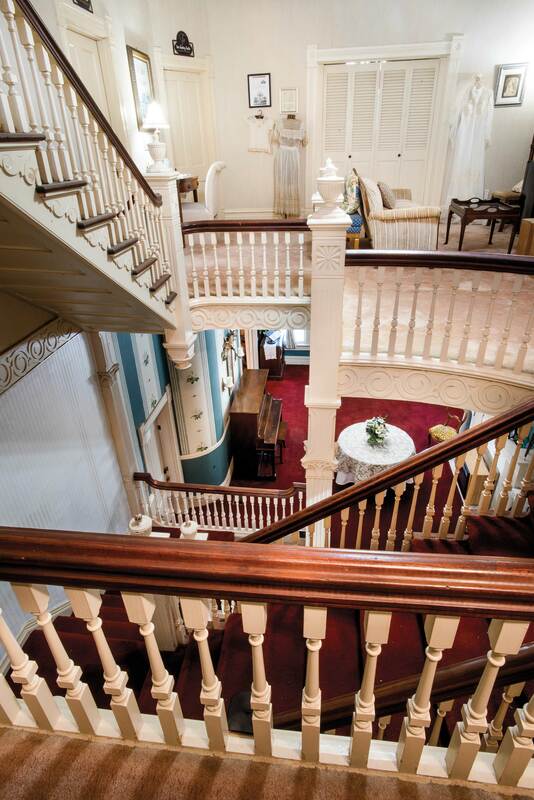 The Walker Manor’s hand-carved staircase. Walker Manor takes care of breakfast, of course, with fluffy grits soufflés as its signature item. For dinner, The Central Station, a restaurant and brewpub with 36 Texas beers on tap, opened last summer across the tracks and one block west of Walker Manor. Owners Tim Barnett and Dale Rhodes built their restaurant on top of an oil boom-era service station, incorporating many of the original building materials and décor. On the Friday night my wife and I walked over for dinner, a band was rocking in the “Garage Music Room,” so we opted for a rooftop deck that offered long views, a cool breeze, and a quiet spot to visit with family who’d joined us. Just as we were walking up the stairs, the lights flickered, something popped, and all of Gladewater lost power. The pizza ovens were unaffected, though. Servers brought our pies by the light of their cell phones, and we chatted and ate in the starlight as the band’s saxophonist played downstairs, accompanied only by the trains rumbling outside. 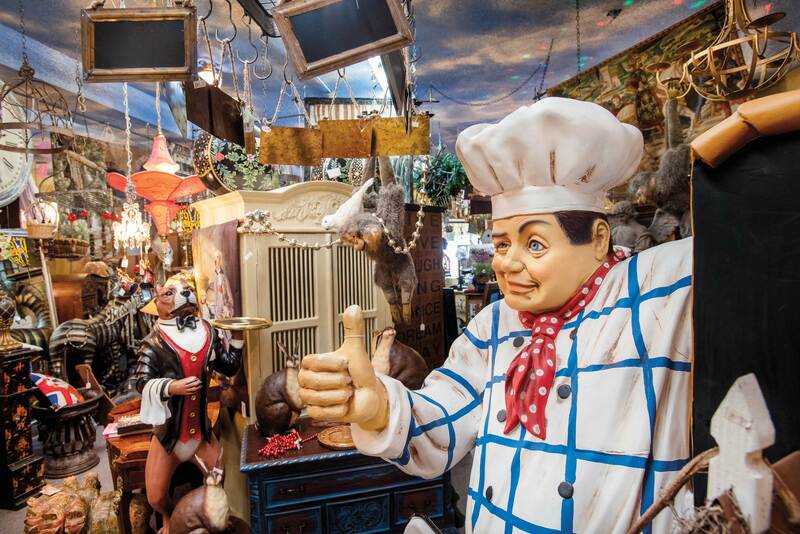 Imported curios fill Decorate Ornate, one of numerous antiques stores lining the downtown. By the next morning, we were back across the train tracks to visit the Gladewater Antique Mall, the oldest and one of the largest stores offering vintage items downtown. 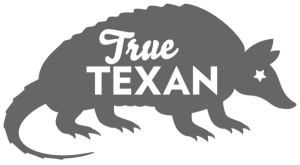 Just around the corner is Decorate Ornate, which specializes in curios and furnishings from Europe, particularly the elaborately carved wooden doors from Italian castles and other extremely old buildings. “I ship back unbelievable things,” said owner Stephanie Chance, who spends a few months each year in and around Italy, where she goes on buying trips and leads excursions for American tourists. On our second night in Gladewater, we ate fajitas at Guadalupe’s Mexican Restaurant, in an old bank building on the same block as Gladewater Books, a sprawling used bookstore, then crossed the tracks again to the Gladewater Opry. The show is held at least once a week in the Cozy Theater, built circa 1936. Singers flock here from throughout the “Ark-La-Tex”—the region where the three states, plus Oklahoma, come together—to perform classic and modern country hits with the backing of a talented six-piece band. Modern country star Kacey Musgraves regularly sang at the opry when she was an unknown pre-teen from East Texas. Gladewater’s musical bona fides go much further back, though. In the 1950s, an up-and-coming Presley is said to have spent weeks in Gladewater playing in beer joints and schools, according to the Gladewater Museum, which also claims that rockabilly pioneer Carl Perkins debuted “Blue Suede Shoes” in the town. And while Johnny Cash told conflicting stories about the origins of “I Walk the Line,” he sometimes claimed to have written the classic song backstage at a Gladewater concert with Perkins in 1956. Six decades later, the Gladewater Opry draws a packed house for its Saturday night shows and rotating lineup of singers. When audience members particularly enjoy a performance, they hop from their chairs, trot down to the front of the theater, and drop dollar bills into a wooden crate on the stage. Between songs, a sassy emcee banters with the band members and keeps a close eye on her husband in the audience—and any of the women she spies hugging him. The Screen Door serves coffee, ice cream, and other treats next to the Gladewater Opry, a musical variety show. We chatted with the Mays until our ice cream was gone, then said good night and strolled to the bed-and-breakfast. It was down the block and a step into the past.